As a creative director and copywriter, I’ve created, developed and managed numerous campaigns for a variety of brands. Below you’ll find a few of the campaigns that I’ve had the pleasure of being a part of. The heart (and non-commercial side) of Toyota\'s US website, this content focused on all of Toyota\'s philanthropical efforts, as well as their safety advances, environmental achievements and more. As part of their new effort to improve mobility for everyone across the globe, Toyota launched the Toyota Mobility Foundation (TMF). This website is meant to tell who they are, what they are doing and where they\'re focusing their efforts. With the release of WB’s “Man of Steel” my team and I had the opportunity to ride the coattails (or capetails?) of the heavily-marketed summer blockbuster to promote Twizzlers (with a limited budget). Our primary goal was to encourage brand engagement, with the ultimate goal of leading to sales. Since the film was an origin story, our solution was to create a Facebook tab that allowed fans to create their own superhero origin story, which was heavily branded in Twizzlers. And because our budget was limited, we created an experience that gave fans a tangible element (a photo) that they could easily share with friends to increase viewership without increasing media spend. Believe it or not, the connection between the Twilight saga and Volvo existed from the very beginning: writer Stephanie Myer wrote that lead character Edward Cullen was a Volvo driver without a partnership with the Volvo corporation. Therefore our job was merely to jump on the coattails of this massive franchise without appearing insincere or forced to the Twilight\'s two primary demos: teen girls and Twi-Hard moms. We created a promotion that not only tied-in to the story of \"Breaking Dawn: Part 1\" but also gave fans a chance to win a trip to the actual vacation spot of Edward and Bella from the film. Oh, and they could win a car too. Reese’s presented us with an interesting challenge: Highlight the partnership between Reese’s Peanut Butter Cups with the NCAA and due to a limited budget for media spend, use the 1mm+ Reese’s Facebook fans as the primary audience. We decided to create content that would engage not just the diehard sports fan, but the fair-weather fan as well, and give both groups a reason to incorporate Reese’s as part of their game day celebration. See more letsgoreeses.com. Google approached Volvo with an interesting request: Create a banner ad that incorporates Augmented Reality in some way and we’ll put it on the homepage of YouTube. 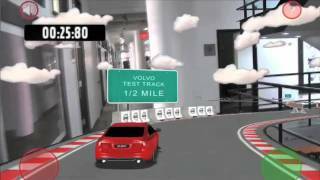 At the time, Volvo’s flagship car was known for its performance so we created an AR game that allowed fans to take the Volvo S60 for a spin, no matter where they were. The game yielded a 9.6%% interaction rate (which is really, really good). How do you have consumers taste whisky over the internet? By hosting a virtual tasting. TasteCrownRoyal.com was an online, interactive tasting in which Crown Royal\'s Master Blender Andrew MacKay, sampled and discussed each of the Crown Royal variants. Users were also encouraged to submit questions to the Master Blender, which were posted online and answered during the taping. In 2007, a friend asked me to help develop a weekly web-based reality show called Project Improviser. Broadcast exclusively on projectimproviser.com this robust content site featured episodes of the show, complete performances, contest/judge bios and more. Produced at the Upright Citizens Brigade theater in New York, we shot, edited and uploaded each episode in 5 days, so that viewers could watch the live show and know who was eliminated before the next live show. Since the show, many of the contestants and judges have gone on to star in shows like Parks & Recreation, Happy Endings and The League.